Pakistan President Asif Ali Zardari today broke his silence on �Memogate� swirling around his government saying he would only accept the verdict of the Parliamentary Committee on National Security, heavily loaded with members of the ruling coalition, which is looking into the issue. Malwinder Singh, the younger brother of Capt Amarinder Singh, today bid farewell to the Congress and joined the Shiromani Akali Dal after being denied the party ticket from Samana. With Trinamool Congress chief and West Bengal Chief Minister Mamata Banerjee today daring the Congress to walk out of the alliance, the party struck a conciliatory note saying differences in a coalition were natural and that their differences would be sorted out. Nurpur experienced snow after 47 years and Kangra after 67 years on Saturday. 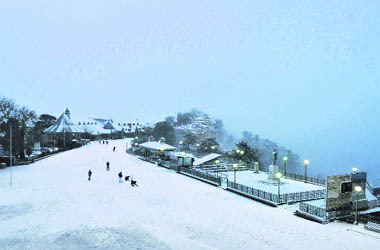 Several warm areas like Jwalamukhi and Chintpurni saw snow after decades. McLeodganj, Dharamkot and upper areas of Dharamsala received about 5ft snow. Traffic was disrupted in the state. Most parts of the state were plunged into darkness after moderate to heavy snowfall for the second day on Saturday. The 300-km Jammu-Srinagar National Highway also remained closed due to slippery road conditions, forcing over 1,300 vehicles to halt at various places. Eleven-and-a-half years after Jassi Sidhu, a Canadian girl of Indian origin, was killed and her husband Sukhwinder Mithu left for dead near Narike village in Malerkotla by a group of contract killers allegedly hired by Jassi�s Canada-based mother and maternal uncle, the Royal Canadian Mounted Police (RCMP) finally arrested the duo from their house this morning in Maple Ridge, British Columbia. If all major banks, both public sector and private, have put up special stalls here to woo overseas Indians, there is a reason: India has been reported to be the single largest beneficiary of remittances made abroad. Metaphorically, it's curtains for Maya in Uttar Pradesh. Chief Election Commissioner S Y Quraishi today said the dozen-odd statues of Chief Minister Mayawati in Lucknow and Noida would remain covered during the Assembly elections. And so would be the hundreds of stone elephants � the ruling Bahujan Samaj Party's official symbol � decorating various Dalit parks.